As the product page will tell you, the MicroTherm is designed to be a snug/athletic fit and mine is just that. The hood has just the right cut to cup your head and keep it warm. And it is more of a cupping hood, not one that can just be worn loosely and for that sometimes it’s hard to hear beyond the sound of your ears or skullcap rubbing against the interior nylon. 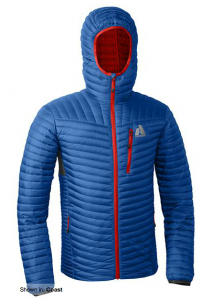 Be sure to check out the great fit comparison video on the Eddie Bauer/First Ascent product page linked below. There are complaints about the feathers leaking from the jacket. I have found this to happen some as well. Naturally, it’s mostly only happening when you are being more active while wearing the jacket and I came back from a yurt trip having worn the MicroTherm to find a few feathers stuck to my next layer but nothing that I felt to be of concern. I find those complaints to be a bit over the top. If you want light thin fabric, feathers will leak until they find a way to take the sharp points off the feather stem. The only other problem I’ve had is the zipper pull sticks a little at the retainer box at the bottom. No problems with the zipper jamming or anything like that, but it doesn’t just zip open. I usually have to take both hands to get the insertion pin out of the zipper pull. Maybe for some that’s a good thing. The outer fabric is ripstop, but I must have rubbed on something gnarly that left an abrasion mark. If your activities include activities where you might be brushing against trees or rocks, you should consider the new Mountain Ops Jacket with a Cordura exterior available fall of 2012 (see video embedded below). This entry is filed under: Blog, Review, Snow.